Why do people say that you have a hard outer shell? Shells are not always hard. 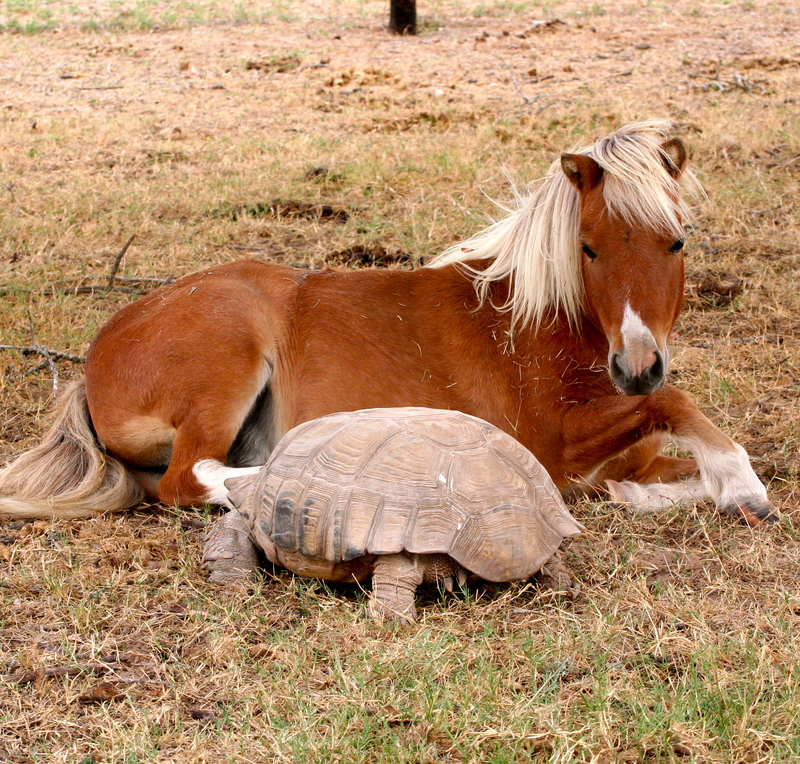 A tortoise or turtle shell is made of the same substance as our fingernails and horses hooves. Nutrition plays a vital part in the health and strength. Too much protein is almost always the culprit. 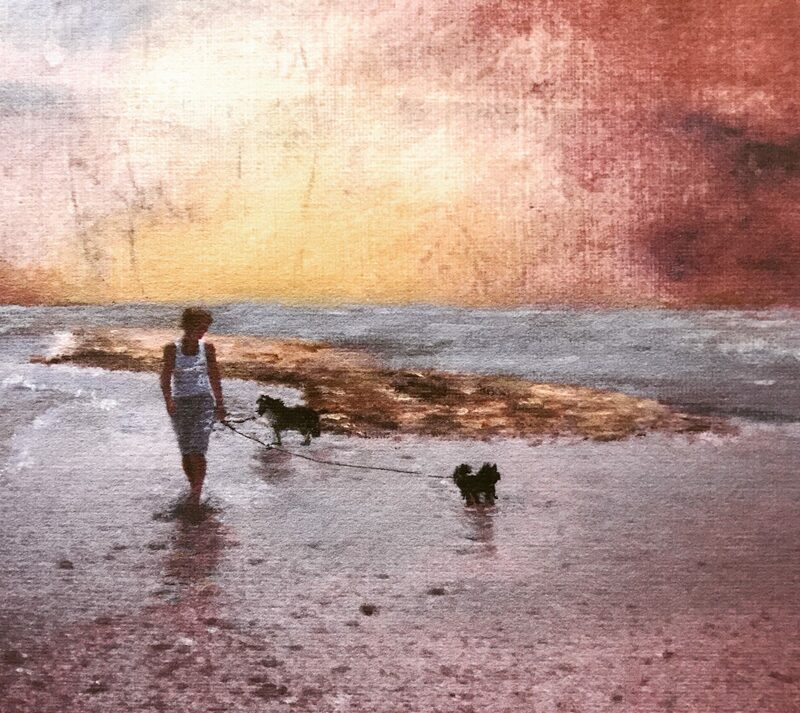 You can look at them and see the degree of health. One of our mini horses has trouble with his hooves…. I have raised Mini Mac since he was a baby and never has he had a problem with his hooves until recently. This entry was posted in African Sulcata Tortoise, animals, family, farm animals, farm life, fast Eddie, friends, health, love, nature, pets, ponies, prayers, proud Aunt, ranch life, reptiles, tortoise, tortuga, turtles, Uncategorized and tagged 80 lb. 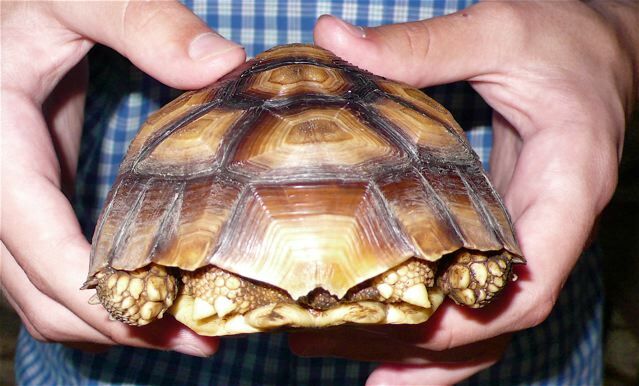 tortoise, African Sulcata Tortoise, care of African Tortoise, deformed plastron, nature, Spurred Tortoise, tortuga. Bookmark the permalink. 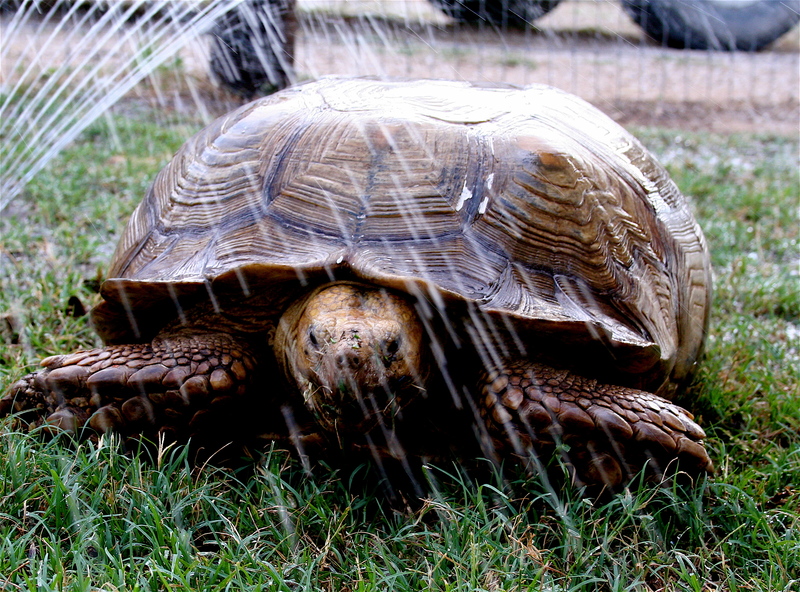 Our African Sulcata Tortoise was estivating last week, which is what they do in winter……but we had 3 inches of rain and the ground was already saturated, so he was underwater and seemingly oblivious to it. The easiest way to move this 80 pound bombshell is to load him up in a wheel barrow.The last time his pasture was icy, I brought him into the house along with his igloo where he closed his eyes and covered his face with his front feet. This was great until Tom came home. I felt like I should tell him that Fast Eddie was in the house, so he didn’t trip over him during the night. He just shook his head and so Eddie was moved to the garage with a space heater and lots of fresh hay on the floor. 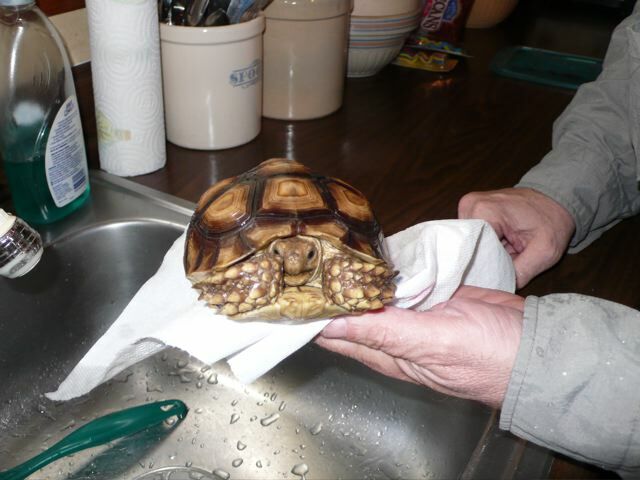 Our tortoise adviser Bruce Deuley gave us good tips about keeping him healthy and warned us not to let him get too cold and especially not cold and wet. During the spring and summer, Eddie grazes on coastal Bermuda grass and we give him treats of bell peppers, romaine lettuce, field greens and cucumbers. The web-site Sulcata Station has great advice about caring for tortoises. Spinach impedes the absorption of calcium and can cause deformities of their shell, so this should never be fed. Iceberg lettuce holds no nutritional value and tomatoes are too acidic. 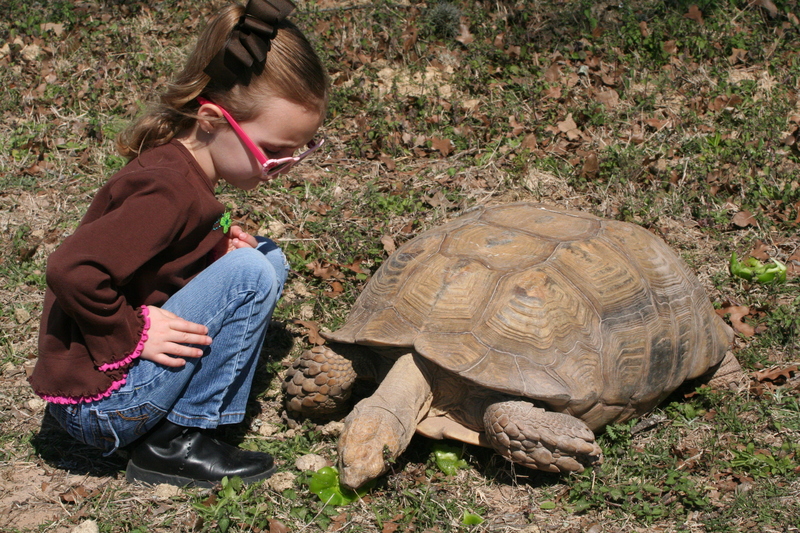 Click here to read more about the care and feeding of the African Sulcata Tortoise. This entry was posted in animals, fast Eddie, tortoise, tortoises, tortuga, Uncategorized and tagged African Sulcata Tortoise, fast Eddie, nature, tortoise. Bookmark the permalink. When the farrier came later in the day to trim hooves, he felt obligated to hand him his tools and accidently dropped a heavy metal object on his foot. When I had securely locked a filly into her stall, he managed to set her free to run around playing hard to catch for the next 30 minutes. I swear it must be a conspiracy to make me happy!!!!! I LOVE you RUSS!!!!!! 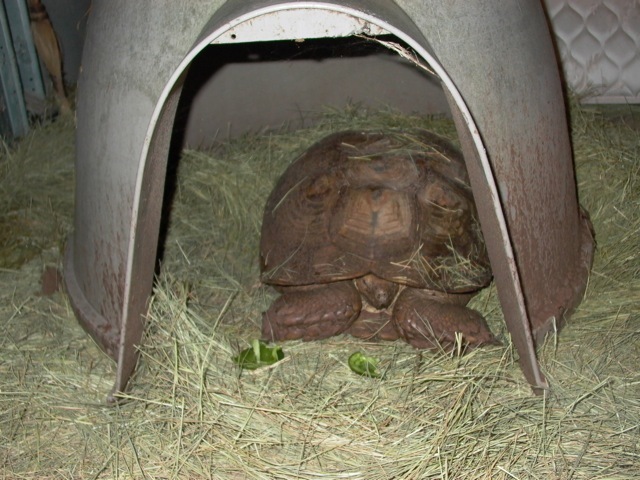 This entry was posted in African Sulcata Tortoise, animals, farm life, fast Eddie, horses, pets, ponies, Pony Boy, ranch life and tagged African Sulcata Tortoise, animals, cancer, family, farm life, funny farm, healing, ponies, tortoise. Bookmark the permalink. “It’s my birthday! Why do I have to take a bath? I hate baths. It’s embarrassing and humiliating, especially when you take pictures.” Poor Tiny T was pouting the rest of the night of his party. He is two years old and three times bigger than he was when he was born. He already has the tiny spurs on his back legs. Meanwhile ,back at the ranch, Fast Eddie was happily taking a shower. 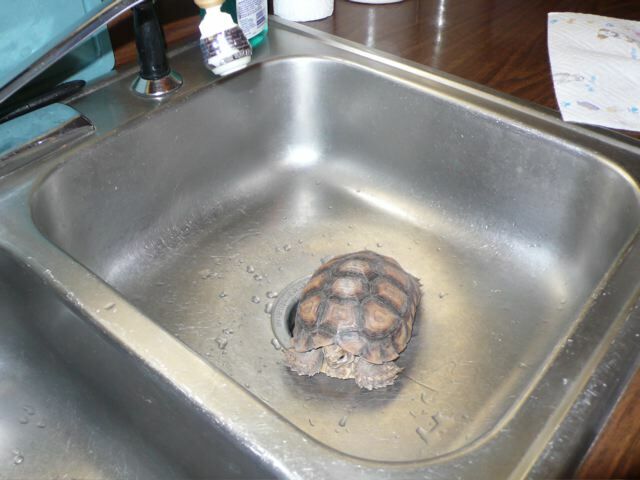 It gets better, Tiny T, it’s tough being a Tortlet. “I can teach you all kinds of ways to get into trouble” Cousin Fast Eddie says. This entry was posted in African Sulcata Tortoise, animals, fast Eddie, nature, pets and tagged African Sulcata Tortoise, animals, fast Eddie, nature, pets, reptiles, tortoise, turtle. Bookmark the permalink. 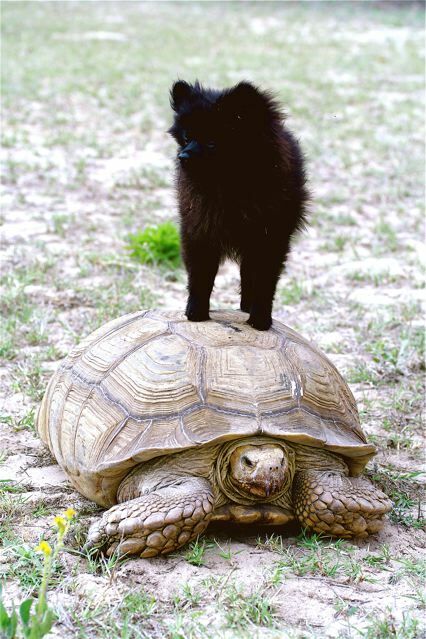 This entry was posted in animals, dogs, photography, tortoise, Uncategorized and tagged African Sulcata Tortoise, Pomeranian. Bookmark the permalink.